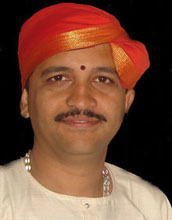 Vidwan Ganapathi Bhat, is a well known name as a ‘Bhaaghavatha’ in the field of Yakshagana over two decades. He is a holder of Vidwath in Sanskrit Alankaarashasthra and is also trained in Yakshagana music at the Udupi Yakshagana Kendra. He has undergone training in Carnatic classical music also which adds more melody to his music. Vidwan Ganapati Bhat has served in various Yakshagana melas as the main Bhaagavatha and is recognized for his versatile voice as well as excellent emotional range. He has also worked as a tutor at Sri Maya Kala Kendra, Keremane. He represents a new era in Yagshagana music and has the credit for spreading the same abroad also. His mesmerizing voice and his unique way of rendering the compositions has taken the Ekavyakthi productions to great height and has won him many accolades. His ability to sing old traditional ragas of Yakshagana makes him a real vidwan! Anantha Padmanabha Phatak, is a multifaceted artist who can sing, act and play rhythmic instruments like maddale and chande with the same felicity and ease. Patak is a student of Yakshagana Kendra Udupi. His career started as a percussionist at ‘Neenasam’ troupe at Heggod. He later worked as an artist and tutor at the Udupi Kendra and Yaksharanga directed by Dr. Shivarama Karanth for eight years. He also trained many young enthusiasts in playing maddale and chande at Sri Maya Kala Kendra, Keremane. His unique and intricate way of playing the maddale has added more color and charm to the Ekavyakthi performances. His involvement in art during the show always inspires the artists on stage through special effects. 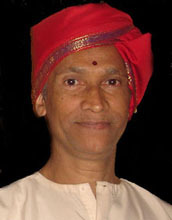 Krishna Yaji Idagunji, is a senior percussionist who started his career at the famed Idagunji Mahaganapati Yakshagana Mandali. 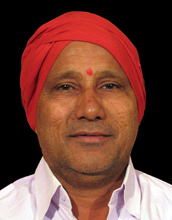 He is well versed in Playing Chande, maddale and Tabla. His style of incorporating ‘Shruthi and Laya’ while playing the chande is impeccable. He is one among a few who can make the instrument talk along with other accompaniments and his percussion never makes noise! He has at his credit Solo performances, Laya laasya, and a jugalbandi performance with tabla. 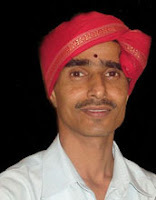 He effectively uses his instrument, chande for streevesha also which is a rare capacity in Yakshagana. Rajashekara Hande also hails from Kota, Udipi Taluk, has his Yakshagana training, capable of performing supportive roles even today. But his presence in this team has become inevitable because of his devoted job behind the screen. He takes care of all costumes and green room activities. Artist feels confident by his support during makeup and dressing and change over. During ‘Nadumane’ performances he also handles stage designing, sound and lighting.